1. Fill a large pot with water and place over high heat. Once water comes to a boil, add pasta and a small handful of salt. 2. Boil pasta, stirring occasionally, until al dente. Drain and toss with a small drizzle of extra virgin olive oil. Set aside. 3. Place a large skillet over medium heat and melt butter. Continue to cook butter until browned and a nutty flavor is released. 4. Add garlic and cream and increase heat to medium-high to bring to a boil. Lower heat and simmer until mixture reduces by 1/3. Season with salt and pepper. 5. Slowly whisk grated Parmesan into the cream mixture until fully incorporated and smooth. Continue to simmer sauce for 2 to 3 minutes or until thick enough to coat the back of a wooden spoon. Stir in peas and remove from heat. 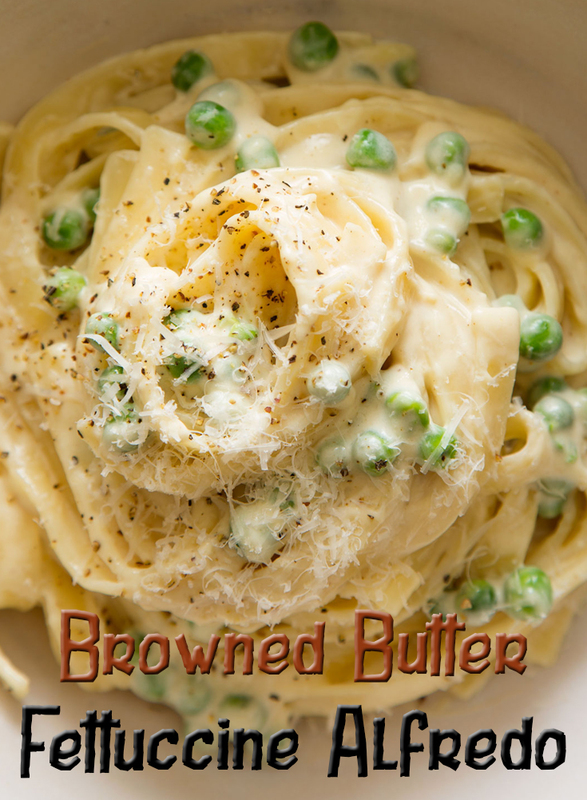 Toss fettuccine into the browned butter alfredo sauce until completely coated. Adjust seasonings. Top with extra grated Parmesan if desired and serve.